I always feel more relaxed when my kitchen is clean. I hate when the counters are dirty and the dishes piled mile high and the stove top dirty. In fact, when I’m cleaning I always tackle the kitchen first because it’s normally the biggest job. When it’s done, cleaning the rest of the house feels like a piece of cake! 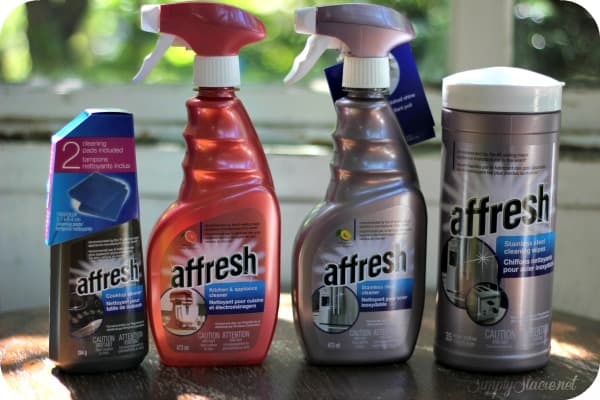 Recently I had the chance to try out some affresh cleaners for the kitchen. I’d heard of affresh and always associated it with dishwashers so I was really looking forward to trying out their line of kitchen cleaners. I clean the kitchen daily, but it always seems to go right back to being a mess (why is that?!). I started out with affresh™ Kitchen & Appliance Cleaner on my fridge door and microwave. Just spray and wipe with a clean cloth or paper towel. I have a black fridge so it’s always full of fingerprints. It made it look like new again with it’s glossy black finish. I tried to get a picture, but it was so shiny that the picture looked really bad. You will just have to take my word for it (or try it and see for yourself on your non-stainless steel appliances). It’s safe to use to clean inside the fridge as well. I love the invigorating citrus scent! The affresh™ Cooktop Cleaner comes with two non-abrasive cleaning pads and is safe to use on all glass, ceramic and porcelain cooktops. We have a white stove which seems to attract dirt and grime. I was expecting to have to scrub really hard to get off the hardened grease, but it came off with a quick swipe of the cleaning pad and a little affresh cooktop cleaner. After going over the entire stove with the cleaner and pad, I buffed it with a paper towel to make it nice and shiny and get rid of any excess cleaner. Worked like a charm! We don’t have any stainless steel appliances besides our new toaster, but I do have a stainless steel sink! I tried the affresh™ Stainless Steel Cleaner on my sink to see how it would work. I sprayed my sink with the cleaner and then wiped it up with a cloth. My sink never looked so good! I loved the scent of this one. It smelled to me like berries! If you have stainless steel appliances, this is the product to buy. It will make your appliances sparkly clean and remove fingerprints and smudges. The affresh™ Stainless Steel Wipes contains 35 wipes that you use to quickly clean your stainless steel appliances. I use wipes in other parts of my home so I know this would be one I would use often if I had stainless steel appliances. Check out this complete list of stores across Canada where you can purchase affresh Cleaners. My kitchen is clean and shiny right now and then I can repeat the same process tomorrow!! Ahhh the work never ends does it? I would really like to try the stainless steel wipes. I would love to try the kitchen and appliance cleaner. I have tried all the Affresh products and I can tell you that they are the best on the market. I have been amazed at what they can do. My favourite is the kitchen and appliance cleaner, but as I said, they are all great. Stainless wipes indeed!!! How cool! The Kitchen and appliance cleaner. I want to try the kitchen & appliance cleaner because I can’t seem to get my stove top clean. I WOULD LIKE TO TRY THE KITCHEN AND APPLIANCE CLEANER. IT WILL MAKE THEM LOOK NEWER I THINK. The Affresh Stainless Steel wipes! The kitchen and appliance cleaner on my microwave. is the one that I want to try the most. The affresh™ Kitchen & Appliance Cleaner because the cats get nose and paw prints all over the lower half of the fridge door! Would LOVE to try the Stainless steel wipes!! The product I’m most interested in is the affresh™ Cooktop Cleaner. WOW Everything sounds Perfectly clean ! would love to try the stainless steel cleaner you used on the sink – mine never looks clean. 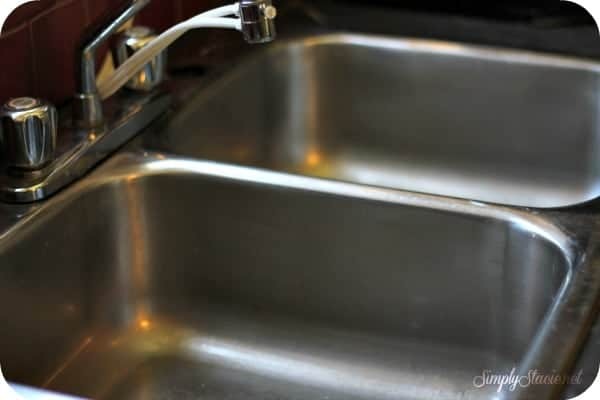 My kitchen sink is 60+ yrs old now and still holding strong but looks dingy so i’d be interested in trying the stainless steel cleaner to see if it can make my sinks look nice again! I have seen the Affresh Kitchen and Appliance Cleaner in the store. I would love to try that product. It looks like it would cut the grease and dirt out very easily. I would love to try out the stainless steel cleaner. I have a sink that never looks shiny. affresh™ Stainless Steel Wipes interests me most. thanks. The appliance cleaner sounds great! The affresh Stainless Steel Cleaner. I most want to try affresh Kitchen & Appliance cleaner.